Why do some animals regenerate missing or damaged tissue and organs while others do not? How are animals able to regenerate new tissue and do they all use the same genetic program? Was the common ancestor of all animals able to regenerate and that trait was passed down to multiple animal lineages while it was lost in others, or has this remarkable trait evolved independently numerous times throughout the animal kingdom? Many animals are able to regrow missing or damaged body parts and some can even regrow an entirely new animal from just a small segment of tissue. If you cut sponges, planarian worms, and hydra into pieces, they will regrow complete and normal animals from most, if not all, of the pieces (Alvarado, 2000). Chop certain kinds of sea stars or hemichordates in two and both halves will grow into complete animals (Carnevali, 2006; Humphreys et al., 2010; Rychel and Swalla, 2008). 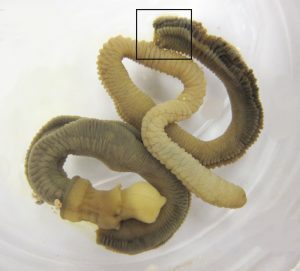 Nearly all annelid worms can regenerate tail segments and some can even regenerate their head. Some species of ctenophores, also known as comb jellies, can heal wounds and regrow new structures without generating any scar tissue. Some crickets and spiders can regrow missing legs and even some hard-shelled invertebrates, like crabs and lobsters will regenerate missing appendages during molting. Nearly every animal phyla has members that are able to regenerate to some degree (Alvarado, 2000). The vast regenerative abilities found throughout the different animal lineages suggest an ancient and ancestral mechanism for this trait. It is likely that the common ancestor of all animals was able to regenerate and this remarkable characteristic has been highly conserved in many groups. The answer to this question, as well as how and why certain animals regenerate, remains a mystery, but through the concentrated efforts of scientists studying this process, like myself, we are getting closer to finding the answers. I am a fourth year Ph.D. student in the Biology Department at the University of Washington. Over the years, my research has been driven by these fundamental questions and has evolved into focused areas of regenerative science, including stem cells and central nervous system (CNS) regeneration. Humans have limited regenerative abilities, particularly in the CNS. When nerves are damaged or destroyed in the brain and spinal cord, they typically will not regrow. It is imperative to understand the barriers preventing this process and develop approaches to overcome these obstacles as millions of people suffer from brain and spinal cord injuries, as well as neurodegenerative diseases, like Parkinson’s, Alzheimer’s, and Huntington’s to name a few (Brown et al., 2005; Mahabaleshwarkar and Khanna, 2014). One way to gain a better understanding of CNS regeneration is to study animals with extensive regenerative abilities. This is the path my research has taken. Figure 1. Ptychodera flava, a hemichordate, from Honolulu, Hawaii. Figure 2. Ptychodera flava collection sites. A) Tetiaroa, French Polynesia. B) Paiko Bay, Honolulu, Hawaii. Figure 3. 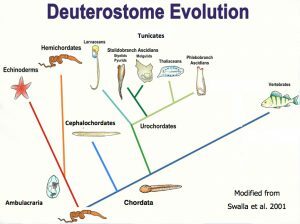 Deuterostome phylogeny. Humans are vertebrates, to the right. Hemichordates are a sister group to the well known echinoderms. I study CNS regeneration in the solitary hemichordate, Ptychodera flava. This animal is also known as an acorn worm and is closely related to echinoderms, like sea stars and sea urchins. Hemichordates are strictly marine animals and all have a tripartite body plan with anterior proboscis that is used for digging and burrowing in the sand and mud, a middle collar region, a ventral mouth between the proboscis and collar, and a long posterior trunk (Figure 1). This particular species of hemichordates lives in the tropical waters of the Indo-Pacific and we collect them in Hawaii and Tahiti (Figure 2). 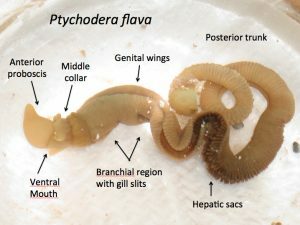 Hemichordates are in the same group of animals as chordates, including humans, and as such, share numerous developmental and morphological features (Figure 3). 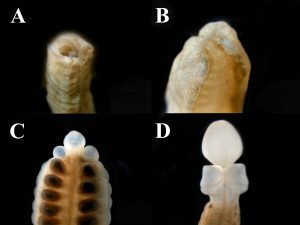 Most notably for my research, P. flava has a hollow, dorsal neural tube in the collar region that our lab has shown develops in a very similar fashion to the chordate neural tube. In humans, the neural tube becomes the brain and spinal cord. More impressive is the fact that P. flava can regenerate its neural tube after complete ablation. In fact, they can regenerate all of their body structures. I bisected adult worms in the trunk region (Figure 4) and after two weeks of regenerating at 26°C, the posterior half of the animal has regrown a new proboscis, collar and neural tube, and anterior region of the trunk (Figure 5). As humans, we have lost most of our regenerative abilities, and our lab is interested in whether we still have the genes that are important for regeneration, as we share many developmental genes with hemichordates. Figure 4. Bisected Ptychodera flava. The boxed area indicates the regeneration site of the posterior half of the animal. Figure 5. Regenerating Ptychodera flava. A) The open wound of the cut site on day zero of regeneration. B) Day 1 of regeneration showing the wound has healed. C) Day 7 of regeneration showing the proboscis and partial collar. D) Day 14 of regeneration showing complete proboscis and collar regeneration. We have recently submitted a manuscript for publication that details the regeneration transcriptome for Ptychodera flava. A transcriptome shows all of the genes that are being turned on and off at a particular time when that tissue was collected. We sequenced and analyzed nine different time points during early hemichordate regeneration and identified hundreds of genes regulated during this process. This was part of an overarching transcriptome project that is looking at numerous animals that are able to regenerate to see if there is a common gene or set of genes that starts the regeneration program. If the common ancestor of all animals was able to regenerate and that trait was passed down, it’s likely that the regeneration program will be similar in all animals. Importantly, humans will likely possess many, if not all, of the genes required for the regeneration program. If that is the case, it may be possible to reactivate those genetic pathways using the regeneration program from other animals. Aside from activating the correct genes to start the regeneration program, another possible way to regrow new CNS neurons is to use stem cells. These special cells have the ability to become any type of cell in the body. Hemichordates may use stem cells to regrow missing or damaged tissue. The other possibility is that they use existing cells in their body and reprogram those cells in regenerating structures. For example, a muscle cell in the existing tissue might be reprogrammed to become a nerve cell in the new tissue. To help answer this question, I was awarded a grant though the National Science Foundation as part of the East Asia and Pacific Summer Institute (EAPSI) program to work on a project with one of our collaborators in Taiwan. I am currently at Academia Sinica, the premier Science and Technology Research Institute in Taiwan, using molecular methods with stem cell markers to try and identify what type of cells hemichordates use to generate new tissue. In humans, when a cell differentiates into a particular cell type the cell fate can usually not be reversed or altered. If hemichordates employ this method during regeneration, it will give us a model to study how cell fates can be reassigned. If, on the other hand, hemichordates use stem cells to populate new tissue, this will give us a model to study how stem cells are activated and recruited during regeneration. Hemichordates may use both models to regenerate new tissue and this possibility is exciting because it will give us two models in one system to develop methods for regenerating missing or damaged tissue, including CNS neurons, in humans. Brown R.C., Lockwood A.H., Sonawane B.R. 2005. Neurodegenerative diseases: an overview of environmental risk factors. Environ Health Perspect. 113(9): 1250-1256. Mahabaleshwarkar R, Khanna R. 2014. National hospitalization burden associated with spinal cord injuries in the United States. Spinal Cord 52(2): 139-44. Candia Carnevali, M.D. (2006). Regeneration in echinoderms: Repair, regrowth, cloning. Invert Surv J. 3, 64-76. Sánchez Alvarado, A. (2000). Regeneration in the metazoans: Why does it happen? Bioessays. 22, 578-590. This entry was posted in BEACON Researchers at Work, Notes from the Field and tagged BEACON Researchers at Work, Biological Evolution, Stem Cells. Bookmark the permalink.